A functional, high-performance and responsive luxury fashion eCommerce site with an intuitive user-experience built on the Magento 2.1.5. 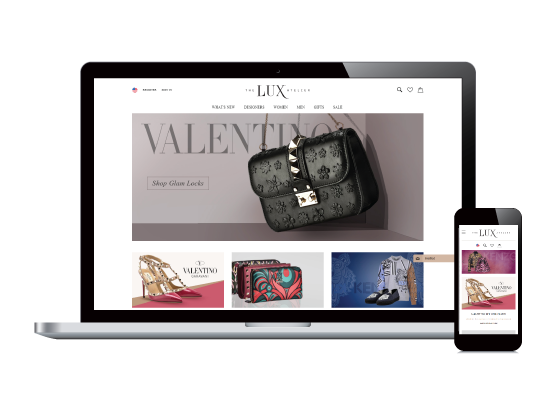 The client, The Lux Atelier, offers high-end fashion products for the elite and needed a robust platform to reach out to an online shopper base. The proposed solution for the client involved developing a bug-free eCommerce site aligned with a responsive web design to cater to its mobile customer base. The site was built on Magento 2.x and tapped into the platform’s capabilities while rooting out its underlying flaws. An efficient Online Shopping Cart with an intuitive User experience. A mobile-friendly shopping site that can adapt itself to multiple devices. Effective real-time synchronization of data between Magento and Third Party CRM. Addition of option for bulk data upload. Fast, error-free and superior website performance. Developing an online shopping cart to facilitate purchases, organize orders and other critical tasks. Creating a mobile-friendly site that worked across devices without compromising on performance. Identifying all the bugs on the Magento 2.x software and segregating them. Making the application stable and devoid of any bugs. Optimizing the bulk upload features in the platform. An online shopping cart was developed using the Magento 2.1.5 platform with a customized front-end and the necessary functionality. To make the site accessible through mobile devices, a responsive web design was implemented and tested for its operation across multiple devices. Our team delved deeper into the platform through extensive testing and a list of the bugs on the platform was compiled. We fixed all the identified bugs on the Magento 2.x platform, optimized it to be error-free and ensured stability. The bulk upload feature that was missing on the platform was added to enable better data handling. The client was immensely satisfied with the solution offered and was impressed with its quality. With the addition of the bulk upload feature, it was easier to add additional products and categories to the website with no major backend work, reducing the manual effort needed for the job and paving the way for better online store management. The client was able to offer a snag-free website to customers and experienced a substantial influx of traffic after its release due to its easy accessibility via smartphones. The smooth navigability and seamless user experience kept the bounce rates to a minimum and the conversions to a maximum, thus enabling the client to generate a high ROI.